The term [muscle] arises from the Latin word [musculus] which derives from the Latin term [mus] meaning "mouse". We can only guess that, just as today, Roman fathers would show their biceps and forearm muscles to their children and tried to make them believe a mouse had gotten under their skin!. The root term for muscle is [-my-]. The corresponding combining form is [-myo-]. 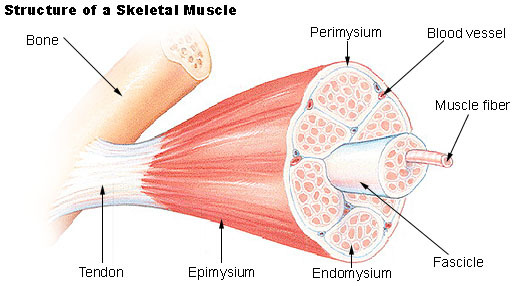 • Skeletal muscle: it is typical of muscles related to bones (skeletal) and they are voluntary. • Smooth muscle: found in organs that act without volition (involuntary), such as the digestive system and glands. • Cardiac muscle: found exclusively in the heart. Skeletal and cardiac muscles have distinct striations visible under a microscope. Original image courtesy of Wikipedia. Click on the image for a larger version.